What is the most frustrating sight for a webmaster? It’s looking at a 404 page on your own website. In this article, you’ll learn how to use a WordPress broken link checker to find and fix broken link in WordPress. Broken links decrease the chances of users coming back to your site. According to stats, if a new user encounters a 404 page during his first experience, there is an 88% chance they won’t come back. The webmaster guidelines provided by Google recommend “Ensure that all links go to live web pages”. Broken links can even downgrade your website’s SEO rank. A typo in your link. Changing the web page to a different directory. The browser opens a 404 error when it can’t find the requested web page on the server. Let’s assume you have a WordPress blog site with many blog posts. Looking for broken links manually would be very time-consuming. That’s where the broken link checker plugins come to help. 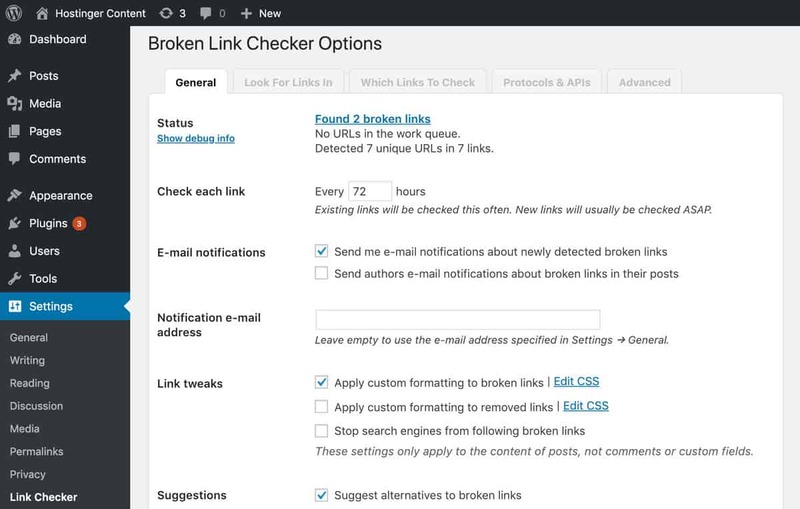 There are several plugins available in the market, but Broken Link Checker is our favorite. It’s open source, well documented and includes many features. All you have to do is download it and install it on your WordPress site. Then activate it. 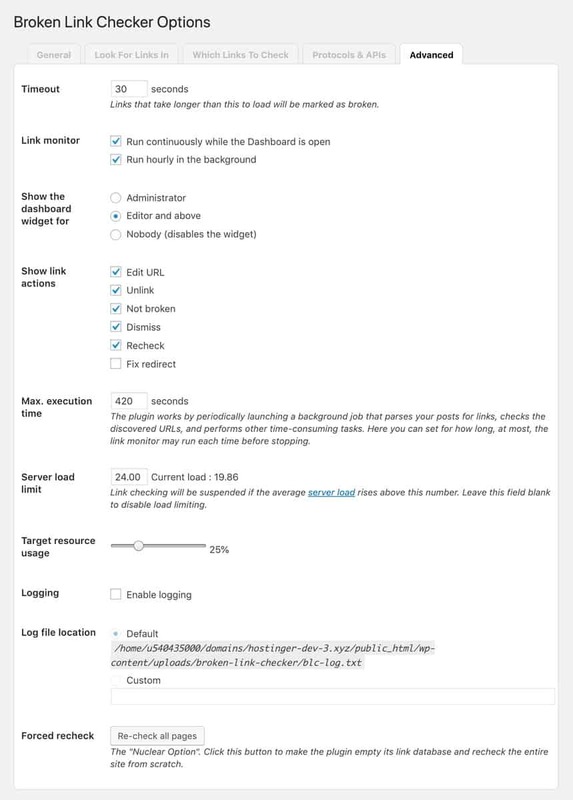 Go to Settings -> Link Checker to see Broken Link Checker’s features and options. After activation, the Broken Link Checker starts scanning your WordPress site for broken links. You can see the results next to the status. Click on Found X broken links to open a page with all the broken links you have on your website. In our example we have two broken links with statuses Server Not Found and 404 Not Found. To fix broken links in WordPress click on Edit URL or Unlink below the broken link. You can also dismiss, recheck or mark links as not broken if you think you get a false positive result. The plugin checks new links as soon as they’re live. In the General tab, you can specify how often you want to check existing links. The default value is 72 hours. If you want to receive emails about detected links, or suggestion for broken links, you can set it here. Under the Look For Links In tab, you can instruct the plugin where you want it to check for broken links. From custom fields and custom CSS to posts and pages – you have got possible every aspect of your WordPress site where you want to check for broken links. Next is Which Links To Check. It includes different types of links. 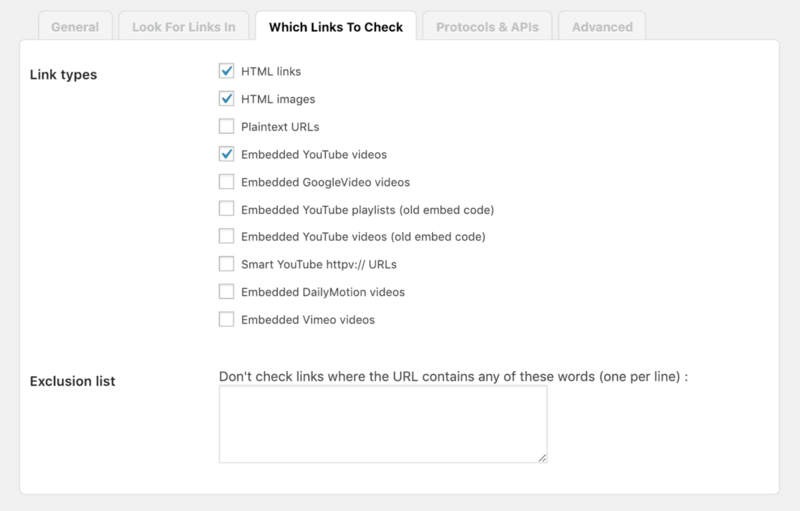 You might notice that Broken Link Checker has given special attention to YouTube videos. It’s because there are multiple ways to embed YouTube in WordPress. Broken Link Checker doesn’t stop from there. 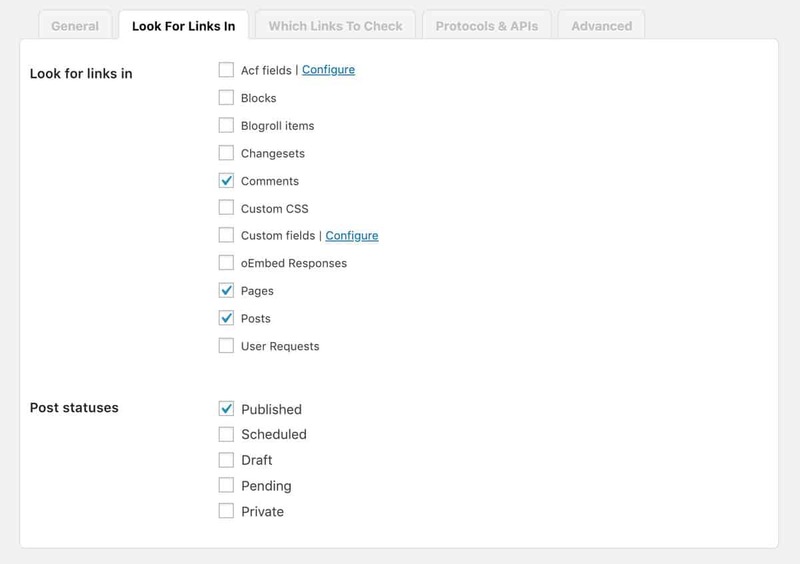 You can also set which protocols to use when checking links. Go to Protocols & APIs if you want to change them. Finally, you have the Advanced tab. One of the most important setting options. By default, the Broken Link Checker marks links as broken if it takes more than 30 seconds to load them. This value can be changed here. Another useful feature is Re-check all pages. If you press this button, the plugin will re-check all the links you currently have. Other options such as bulk link editing and unlinking are found here as well. Once the plugin is configured, a box will appear on your main dashboard. There you’ll immediately see any detected broken links. That’s all! You’re ready to go. Try the Broken Link Checker and boost your WordPress site’s SEO and improve user experience by fixing one annoying problem.